Exciting News You Don't Need to Know How to Knit! Don't knit or Crochet? Don't worry. 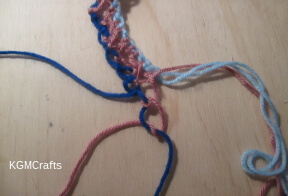 These yarn crafts for kids are simple to do. Make pompoms or do easy weaving projects. 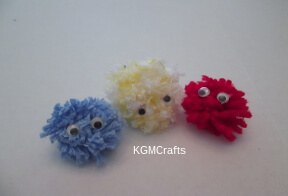 And if making your own pompoms is too difficult there are some crafts that use store bought ones. something out of it too. 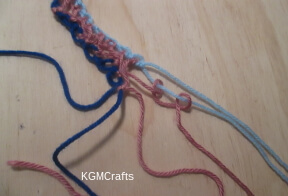 Knot some yarn and make a bookmark! Or scroll down for links on how to make pompoms or simple weaving projects. 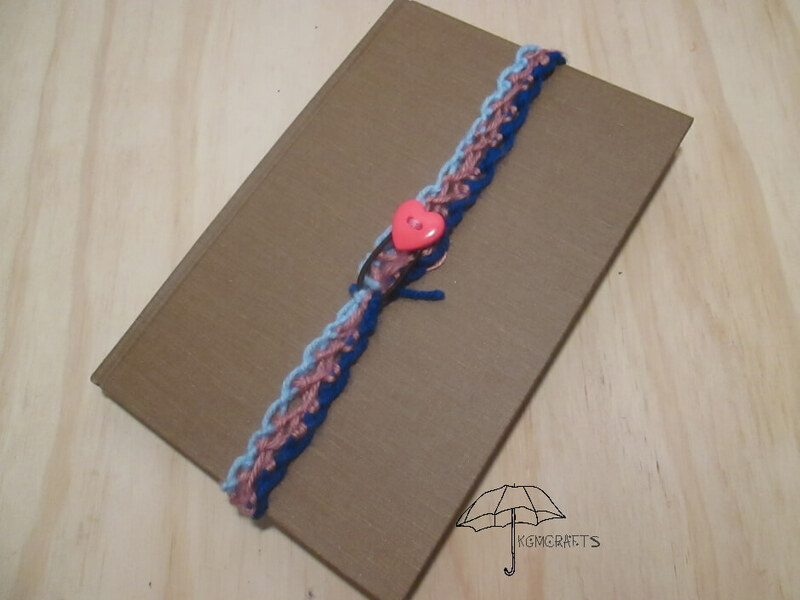 Wrap the yarn around your book six times. Fold each color in half. Place a loop in the center of the ponytail holder so that it is at the bottom. 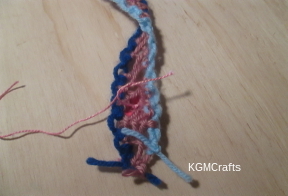 Fold the loop over the holder and grab the cut ends of the yarn. 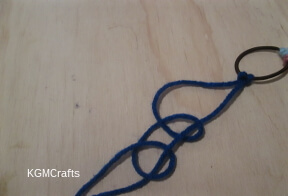 Pull the ends through the loop so that it makes a knot. Do the same with the other two piece of yarn. 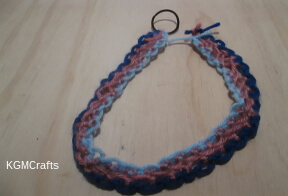 You will have six strands of yarn, two of each color. The strands of yarn are numbered from left to right. In the picture, the dark blue is number one and two and the light blue is number five and six. Step 1 Bring strand one under strand two and through the loop. Then over strand two and through the loop. Step 2 Bring yarn six over strand five and through the loop. Then under strand five and through the loop. Step 3 Bring strand four over strand two and through the loop. Then under strand two and through the loop. Step 4 Bring strand three under strand five and through the loop and over yarn five and through the loop. 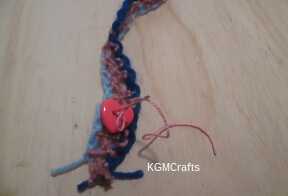 Continue knotting until the bookmark is the desired length. Cut off excess yarn. Cut a small piece of craft string and thread through a needle that will go through the hole of the button. 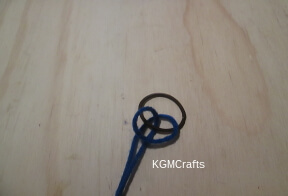 Tie the string two or three times in the back to make a knot and secure the button. 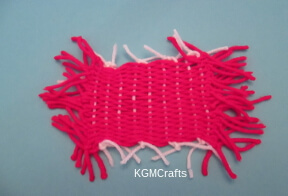 click on the pictures to make some yarn crafts for kids today! To make pompoms you will need something to wrap the yarn around. It can be small or large. Then wrap around and around. Out comes a cute creature. Well, you can use the store bought pompoms. They will also make cute items. My paper plate has a hole and my doll is cold. Look here is the solution. Let's fill the hole by weaving and make a baby blanket too. String isn't just for the cute, adorable kittens to play with. No, you can make something out of it too. Something big, something small. Maybe a monster or a little bunny cottontail. You didn't need to learn how to use a hook or a needle. 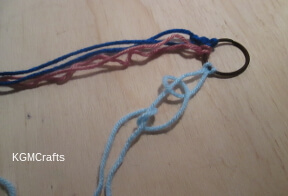 All you needed to make these yarn crafts for kids were your hands and one other thing or two. It wasn't too hard and was a lot of fun. You probably want to make some more - ahem - I mean the kids do. Well as long as you're both having a great time, let's try it with a different type of yarn.